Daniel Williams - Texas: Is a Republican House Member Hosting a Fundraiser for Dallas' Pride Parade Grand Marshall? Is a Republican House Member Hosting a Fundraiser for Dallas' Pride Parade Grand Marshall? Dallas' Pride Parade, The Alan Ross Freedom Parade, is September 18. The parade's "special VIP Guest" is English rugby star Ben Cohen, whose StandUp Foundation works to raise awareness of the long-term damaging effects of bullying. Cohen, who is straight, was inspired to create the foundation after hearing from LGBT friends about the difficulties they experienced. "I am passionate about standing up against bullying and homophobia in sports," says Cohen, "and feel compelled to take action. It is time we stand up for what is right and support people who are being harmed." In honor of Cohen the week leading up to the parade, September 12-16, has been declared "Stand Up Against Bullying Week" in by Dallas Mayor Mike Rawlings. According to this Facebook event the week will culminate in a fundraiser for the StandUp Foundation on Friday night at the Highland Park Home of Jim Pitts. Rep. Jim Pitts (R-Waxahachie), is chair of the powerful Appropriations Committee and a 20-year Republican member of the House... which begs the question of whether the Jim Pitts who is hosting Cohen's event is the same Jim Pitts who supported efforts this last session by Wayne Christian (R-Center) to ban LGBT resource centers from Texas College Campuses. A search of the Dallas County Central Appraisal District's website indicates that the address given for the fundraiser is owned by Pitts 2007 Properties LTD, which is a subsidiary of Pitts Property Management LLC, which is owned by none other than Jim R. Pitts, the honorable representative from House District 10. So it seems that Rep. Pitts is, indeed, hosting the event: for which I give him kudos. 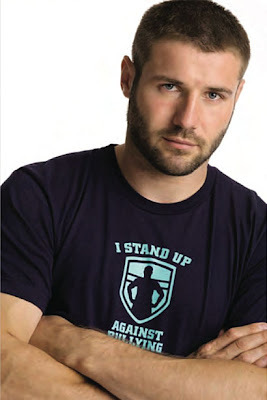 The StandUp Foundation does good work and Ben Cohen is, by all accounts, a fierce advocate for the LGBT community. Hosting the event is in keeping with Pitts' voting record this last session, he voted for both HB 1942 (the "super" anti-bullying bill) and HB 1386 (the teen suicide prevention bill). I would ask, however, that Rep. Pitts consider his votes on other issues and how they effect bullying in Texas schools. It's not enough to say that LGBT kids shouldn't be bullied or harassed if your actions tell their tormentors that LGBT kids aren't as deserving of respect or resources as other people. There is a direct line running through Christian's statements on the House floor calling LGBT people disgusting and the middle school student who punches an effeminate child for being a "fag." When Pitts fails to stand up to the former he enables the later. This inconsistency, this willful refusal to see the systemic discrimination faced by LGBT adults as the license that allows the torture of LGBT children, is, in ways both figurative and literal, killing our children - and it has to end.